Skin MD and Beyond offers a comprehensive range of injectable treatments including Botox, Dysport and a wide range of Facial Fillers. With over 1 million Botox injections completed and the widest range of facial contouring treatments, performed only by our doctors, we are your no.1 choice for Injectable Facial Contouring in the Dallas Fort-Worth Metroplex. Our philosophy is to use a “less is more” approach to non- surgical cosmetic treatments. If someone knows you have had a non- surgical treatment, they assume you are much older than you look. And that is why we recommend subtle, natural results. No wind tunnel treatments. That doesn’t mean you need to compromise on value. We ensure a full choice of products to ensure your treatment LASTS. What is Non-Surgical Injectable Facial Contouring? Traditionally, facial shaping and face lifting has been performed exclusively by surgical means. With the introduction of Facial Filler and anti-wrinkle injections (Botox / Dysport), it is now possible to shape, volumize and lift the face and make subtle yet significant changes without the need for surgery. The key difference between the non-surgical procedures and the surgical procedures is that the non-surgical procedures require little or no downtime/recovery. Furthermore, as expected, non-surgical procedures carry little risk, and require no general anaesthetic. Rejuvenation – This is when fillers are used to replace lost volume and to return the face to a previous more youthful state. Enhancement – This is used to enhance areas of the face such as the cheeks, nose or lips to balance or enhance the facial shape. Tear troughs or eye hollows, brow shaping, chin shaping, lip enhancement, cheek enhancement, nose reshaping, and jowl reduction can all be performed with dermal fillers. Non-Surgical Facial Shaping requires significantly less downtime and risk than surgery, and requires no general anesthetic. What Non-Surgical Facial Contouring treatments are available at Skin MD and Beyond? One of the key factors that contribute to facial ageing is loss of facial volume. This is often overlooked when rejuvenating the face. Replacing lost volume is in many cases more important than surgically lifting the face. Lifting the face surgically without replenishing lost volume can often result in an unnatural appearance. Revolumizing the face does not always replace the need for a surgical procedure, but in many cases, surgery can be avoided or delayed simply by strategic revolumization of the face. Skin MD and Beyond offers a wide variety of these non-surgical facial shaping treatments. Tear troughs, or the hollows under the eyes, can make one appear tired when they are not. 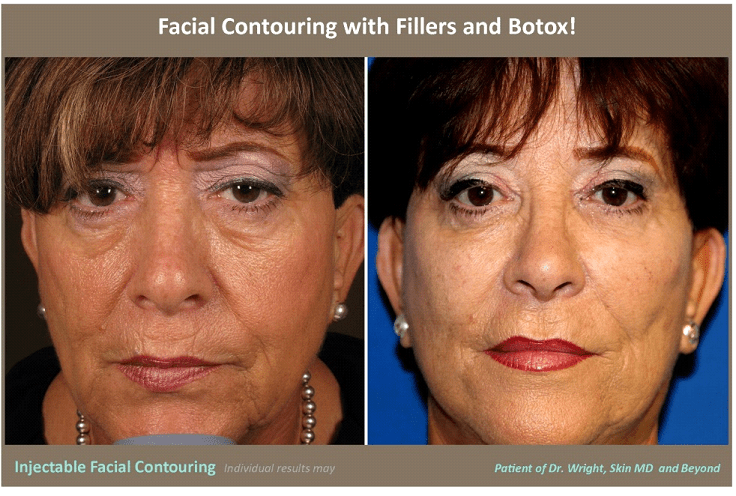 Through the use of dermal fillers, these can be disguised. Furthermore, the appearance of eye bags can be reduced by the placement of filler around them. To learn more click here. Eyebrows can be enhanced through filling and lifting the brow area with dermal fillers and anti-wrinkle injections. This is an alternative to having surgery to remove the upper lid skin or lift the brow, which can often result in a hollowed out appearance. To learn more click here. Chin enhancement can be performed non-surgically with dermal fillers. This can help to balance the profile, and extend the jawline. It is a good alternative to a chin implant. To learn more click here. Cheek enhancement can be performed with dermal fillers to replace the volume that has been lost with time, or to further enhance the shape of the cheeks. To learn more click here. Through the use of dermal fillers it is possible to straighten the appearance of the nose, including left/right deviations or bump in the nose – without surgery. For those who have lower nose bridges, dermal fillers can also be used to increase the height of the nose. To learn more click here. Anti-wrinkle injections can be used to slim the jawline to reduce the squareness of a face, as well as to help reduce contraction of muscle that causes teeth grinding or clenching. To learn more click here. The appearance of jowls can be reduced, and the jawline straightened through the use of dermal fillers around the jowls. This hides the appearance of jowls, and provides a viable alternative to surgical treatments. To learn more click here. Skin tightening and lifting can be achieved with non-invasive and non-surgical methods for those who don’t want to have a facelift. To learn more click here. Dermal fillers can be used to replace volume in the lips, shape lips, and to help reduce the signs of ageing around the lips. To learn more click here.